Diane Camurat. The American Indian in the Great War: Real and Imagined. Preface. Table of Contents. Meanwhile, I looked for information on the participation of American Indians in World War I but found little. Books dealing with the general history of Native Americans either failed to speak about the subject or dismissed it quickly with a participation figure which varied from one text to the next. The first concrete elements I found seemed only indirectly related to what I was looking for: emblems. 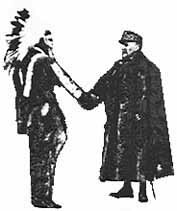 The insignia of the Second Division of the American Expeditionary Forces was a Plains Indian head. (1) Section One of the American Ambulance Field Service also used a similar motif,(2) as well as the Lafayette Escadrille. (3 )Exploring this phenomenon, I noticed that, on pictures of American memorials erected after the Great War in France, the same Indian head profile appears­a motif taken even further in the memorial located in Tours where American intervention has been symbolized by an Indian raising his hands towards an eagle. While exploring visual traces, I also began to become aware of other forms of stereotyping such as the portrayal in newspaper articles in the Stars and Stripes, the official review of the American Expeditionary Forces, of the "typical" image of Native American soldiers as brave yet primitive warriors. The presence of American Indians in the Great War as symbols interested me all the more as I found little on their actual presence. Accordingly, I began looking for information on the image of the Indian, in order to try to understand the meaning of the symbol of the Indian in the Great War. At this point, I had the good fortune to be directed to Russel L. Barsh. The information he sent me and the discussion we had later helped me a great deal to advance in my understanding of the subject of the actual presence of Native Americans in WWI. At the same time, with no desire to duplicate Russel Barsh's extensive research, and without the time in the course of a year's research to explore American archives myself, I realized that Russel Barsh was likely to be my only source on this aspect of my study. I therefore decided to put less emphasis on my treatment of the presence of American Indians in military units in France, and devote more energy to exploring the causes that led to their participation in the first place. In the same way, all consequences of the participation of American Indians in the Great War are limited in my study to the years immediately following WWI. It would have been quite another undertaking to analyse the long-term consequences of their military experience. During my investigations at the French military and diplomatic archives, I rapidly realized that I would find little, if anything, on the participation of Native Americans in the Great War. Thus, I turned increasingly towards the B.D.I.C. (Bibliothèque de Documentation Internationale Contemporaine) in Nanterre, the Documentation Center of the Historial de la Grande Guerre (Museum of the Great War) in Péronne, the C.R.H.E.U. (Centre de Recherches sur l'Histoire des Etats-Unis) in Paris, and the B.P.I. (Bibliothèque Publique d'Information, Beaubourg) in Paris, for primary sources in the form of original documents or compilations of texts made later. As time went on, I gathered more and more primary documents, along with all the related secondary sources, the analysis of which helped me to understand many unclear points. I eventually found myself with more material than I had anticipated. What there was enabled me to carry out this study but, even more than that, it opened vistas of promising fields of study. 2. Were Native Americans Subject to the Draft in 1917? 1. The "Redskins" Against the "Huns"
1.2.2. The "Hun" Identifying with the "Redskin"
1.2.3. The "Huns" Frightened by the "Redskins"
1. "War as a Civilizer"
1 . Stars and Stripes. January 17, 1919. 2 . L'Illustration. n°3961, February 1, 1919, facing p.118. 3 . Postcard edited by the Réunion des Musées Nationaux, 1992. "Fragment de toile ayant appartenu à Harold Buckley Willis." Musée national de la Coopération Franco-Américaine, Château de Blérancourt. Lieutenant-Colonel Georges Thenault. L'Escadrille Lafayette, Avril 1916-Janvier 1918. Paris: Hachette, 1939, p.75.